Equipment: 14 inch Dob, 27mm Panoptic, 14mm Pentax, 10mm Pentax (all with Type I Paracorr). NGC 4567 is mag. 11.3 with a size of 3.0’x2.0′. 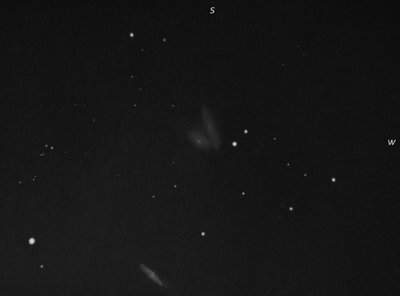 NGC 4568 has a mag. of 10.8 and is 4.6’x2.0′ in size; NGC 4564 is mag. 11.1 with a size of 3.5’x1.5. Notes: This was my last sketch of the night as we felt the moon was going to rise about 1:40 a.m. or so but in reality, it did not come up until after 2:10a.m. NGC 4567 is the northern most galaxy of the two that are colliding. It is rather bright, and fairly small in size. It is more roundish in nature than its colliding companion. NGC 4567 has a higher surface brightness than NGC 4568. NGC 4568 is the southern member of the colliding galaxies here. It is pretty bright and rather large and is elongated SSW to NNE. The core is very bright. NGC 4564 actually should be just a little more off, but I ran out of paper and wanted it included in the sketch. It is smaller in size than the other two, and is bright. Like NGC 4568 it is elongated but SW to NE. There is outer diffusion and then a brighter core region with a stellar nucleus. WOW. Very realistic sketch, as if I could see through the telescope! Wow, very realisitc sketch! !Top obseravation and technic! !